Production Begins on Yamaha "MAJESTY 125FI" Fuel Injection 125cc Scooter Clears world's toughest "Taiwan Phase 4" emissions standards by big margins - News Releases | Yamaha Motor Co., Ltd.
Yamaha Motor Co., Ltd. (YMC) has recently succeeded in the development of its first scooter ever to feature a fuel-injection engine scooter. Named the Yamaha MAJESTY 125FI, this new model boasts environment-friendly performance that clears the worlds toughest emissions standards, the Taiwan Phase 4, as well as achieving low fuel consumption and outstanding running performance. This new model is being manufactured in Taiwan at Yamahas manufacturing base, Yamaha Motor Taiwan Co., Ltd., and will be released on the Taiwanese market beginning in the latter part of September. 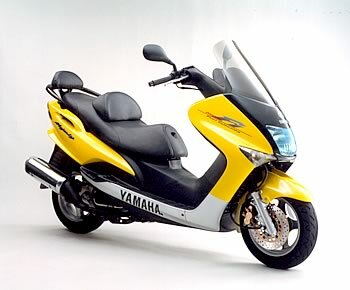 The new Yamaha MAJESTY 125FI takes as its base the Majesty 125, which has been manufactured and sold in Taiwan since 1998, and further developed it around the concept of a comfortable tandem cruising model. While maintaining the basic specs of the existing models engine and chassis, a fuel injection system has been added to (1) provide environment-friendly performance that clears the worlds toughest emissions standards, the Taiwan Phase (recording values equivalent to 50% of the Phase 4 standards for CO, HC and NOx), (2) outstanding fuel economy (39 km/liter under the Taiwan CNS mode, compared to 36 km/liter for the existing model), (3) excellent starting performance and (4) outstanding drivability and running performance that is highly resistance to negative effects of elevation changes and weather conditions. From the standpoint of YMCs new mid-term plan NEXT50, this new model is one that embodies efforts in the Small Engine Strategy portion of the plans Growth Strategy, one of the plans four main action categories. Annual motorcycle demand in Taiwan has stood at about 600,000 units in recent years, with 40~50% of this demand centering in 100~125cc class scooters with 10-inch wheels front and rear. Since its release in this market in 1998, the Majesty 125 has won the support of the users for its large 250cc class body with impressive styling, its comfort and running performance in tandem riding and its economy. This popularity has led to total sales of roughly 37,000 units in these four years. In recent years, there has been a trend toward larger displacement bikes in Taiwan, further spurred by this years relaxation of import restrictions. But the 125cc models remain popular for their economy and convenience and there has been a raid diversification of needs in this class. Furthermore, there have been high expectations for next-generation environment-friendly models that will meet the Phase 4 emissions regulations scheduled to go into effect in November of 2004, which will also be subject to preferential tax rates. The model Yamaha develop to answer these needs for more comfortable and spirited tandem cruising performance plus environment friendliness is the new MAJESTY 125FI. While keeping the same basic machine components, the carburetor has been replaced with fuel injection to provide (1) cleaner exhaust emissions, (2) outstanding fuel economy, (3) excellent starting and (4) running performance that is not affected by elevation changes. All this makes the new majesty 125FI a model that answers environmental needs while also offering comfortable and spirited tandem cruising. A new fuel injection system has been designed specifically for this model and to accommodate it the designs of the manifold and fly wheel magnate have been optimized. In combination with Yamahas Air Induction System and the catalyzer, this new system provides numerous advantages. This model achieves outstanding starting performance at high elevations, at high and low temperatures and after the machine has been left unused for long periods. The optimal control of the air-fuel ratio made possible by the fuel injection system ensures excellent drivability, good acceleration, excellent performance stability at high elevations and steady idling performance. This means steady cruising performances at higher elevations that can reach 2,000 meters in Taiwan. A liquid-cooled OHC, 124cc single-cylinder engine characterized by torque-y performance and quiet running is adopted. In combination with the V-belt automatic transmission it provides spirited running performance and good acceleration. The body that give this model its excellent handling stability and riding comfort is built around a specially design frame that draws on technologies used in the 250cc Majesty model that is so popular in Japan and Europe. The combination of an optimum frame rigidity balance, the long wheelbase and wheels mounting12-inch tires front and rear give this model a truly stayble ride with very neutral handling. The aerodynamically designed cowling also adds to the riding comfort. When used in combination with a catalyzer, a fuel injection system that electronically controls the amount of fuel supplied to the engine produces much cleaner exhaust emissions. For this reason, it is used on many automobiles and larger motorcycles. Due to the increased number of parts and the complications in machine layout resulting from the adoption of a conventional fuel injection system, a simpler type of fuel injection system had to be developed in order to make use practical on smaller motorcycles. In answer to this need, we adopted a new system featuring small-bike specific designs for the (1) sensor functions and (2) the fuel supply system. In a fuel injection system, various sensors that provide information about the running conditions of the machine and the riders operational actions play an important role. In the case of fuel injection systems on 4-cylinder motorcycles like the FJR1300 and YZF-R1, the mechanical and layout complications caused by the large number of sensors necessarycrank angle sensor, throttle opening sensor, intake pressure sensor, atmospheric pressure sensor, etc.has been a problem. In developing the fuel injection system adopted on the MAJESTY 125FI, we recognized the interrelation between a number of parameters, including the dynamic fluctuations in the pressure in the intake duct, atmospheric pressure and the throttle opening. Based on these observations we were able to employ functional multiplicity to reduce what had been up to eight sensors in former systems to just four sensors. The result was a much simpler but highly reliable new system. In a fuel injection system, the fuel supply system employs a fuel pump and an injector to control the fuel supply with a high degree of precision. The fuel injection system adopted on the MAJESTY 125FI employs a compact, low electricity-consumption fuel pump to satisfy the needs of this models small displacement, single-cylinder engine. A further reduction in the number of parts, system weight and size was achieved by combining the regulator and filter into a single module. The resulting unit is only about 50% the size of conventional units, which gave us much greater freedom in designing the machine layout.